Big silence in this thread. How is it going Thijs, any progress? I remerbered today that i bought 2 models a few weeks back. 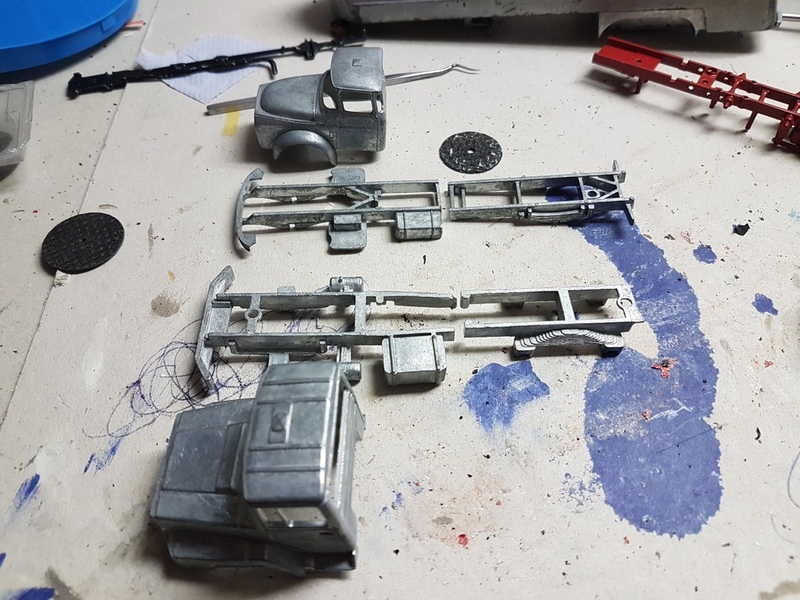 Had some ideas ( thats far i go, building them is something completly different) that i wanted to build so bought them as donor, but they looked to good for use them for that. The turbo was complete gone. But a new one wassn't available, 1 week to wait. Thuesday it was delevered and replaced. But stil not okay. Lost of compression in cilinder one. They think now that the engine gets a overhaul to make it 100%. But they had to look further for that. But it needs a week more, maybe more. It's just what s come out. A new engine head, a overhauled head, it' own head and let that one overhauled. I don't know this moment. Waaaaaah! What a nightmare Thijs. You have my sympathy. My Saxo needs some attention right now but nothing as serious as you describe. Maybe a new head gasket, hopefully nothing worse. when tekno had there 90th aniversery ,they had a event in there museum. many models were for sale for 90 euro,but nothing intresting for me. which i wanted where al sold out, the mack's. but bought me 2 lion toys models, well one and a half. bought them as donor for models i want to make, sometimes, but probably never. and as so ever, i bought models that look to good to be a donor model. a daf torpedo in the livery of the modelclub which i visit almost every 2 months, and the biggest in Europe. 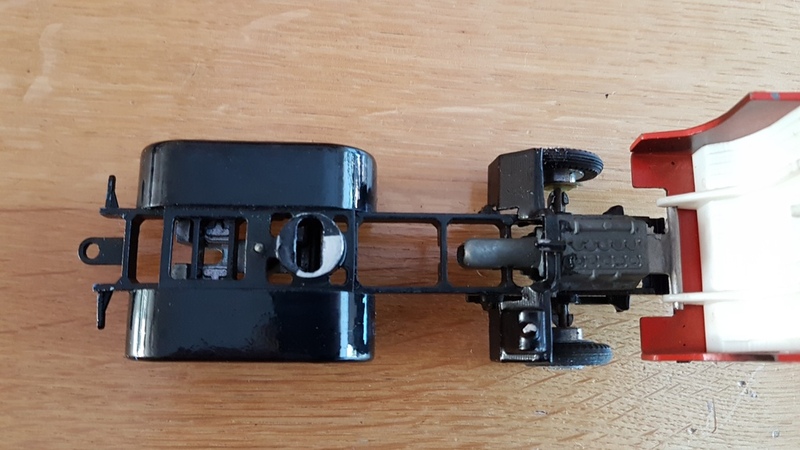 but i never had seen a 3 axle model of this one,also the way the axles where placed and the strange engine. but it was so wel done, that it take some very close look to see how they did it. 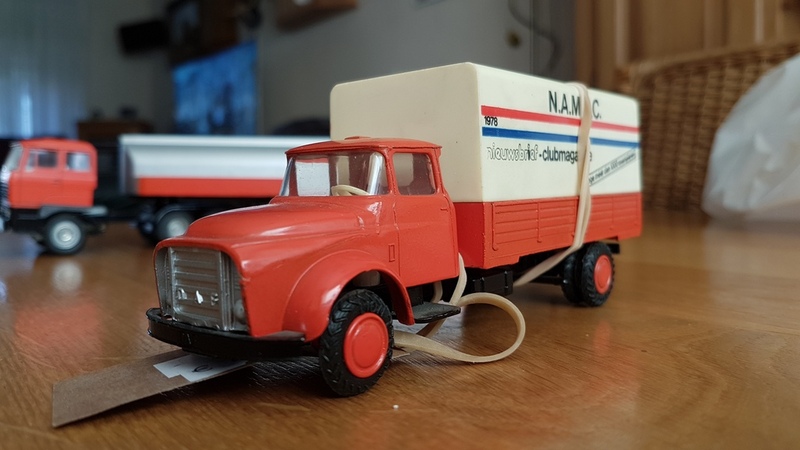 the cab is lion toys, the chassis is a conrad model,but don't know from which truck. so just as the torpedo i keep it like this ,just because of how it looks. 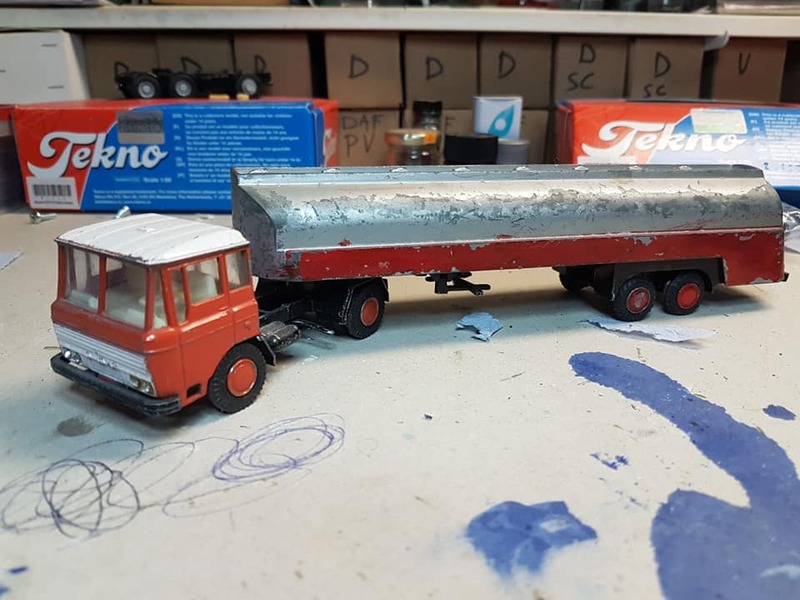 but the trailer will not used, because i have the same trailer ,but with paint damage,so will use that tanktrailer as donor and this trailer goes to the other truck of the paint damaged trailer, then i have a nice set again. the truck of this will be stored for use to buid an other model. 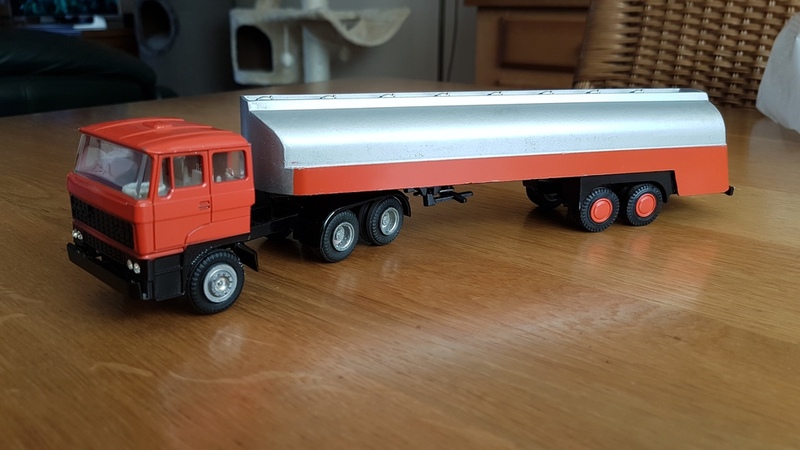 so not really need that i bought it after i was at home in look better to the model, just bought it because of the 3axle chassis,never had seen that. I remember Duel. 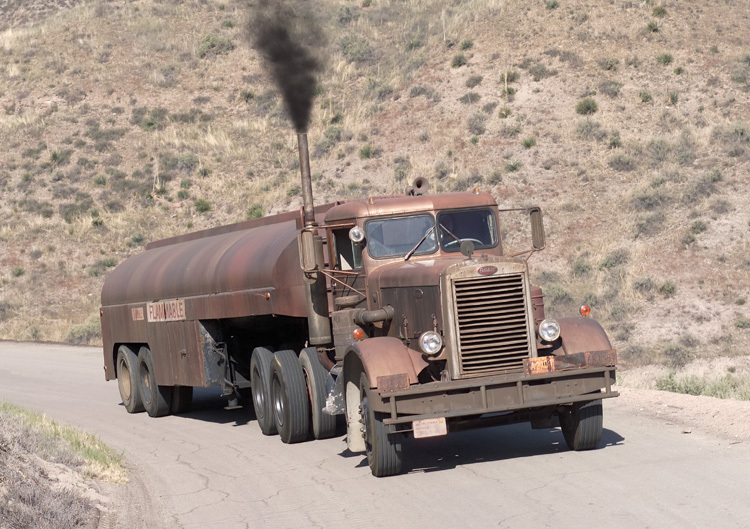 It starred Dennis Weaver aka "McCleod". Have you yet filled up that big bag I sent you? #634, ah - now you're talking! Get going on it, Thijs, it would be really great. It's not on APPLE TV here in Norway, I may have to search another medium. The Duel was originally a short story by Richard Matheson, then Steven Spielberg's 74 minute TV movie, then a 90 minute full cinema movie, for which extra scenes were shot. Later, the same story-line and some of the footage were used in an episode of TV series The Hulk. In the UK, the movie version and the Hulk version were aired by the same TV channel within one month of each other, causing lots of consternation and complaints. People felt very cheated. The TV company, in turn, complained to the agents etc from whom they had bought the licences. Last I heard, they never got any money back. It's not my favourite movie. Although Spielberg thought Denis Weaver was perfect for the part, by the time The Duel was shown in the UK, Weaver was well known as McCleod. He was not a great character actor, therefore seemed to be exactly the same person but with a different name. It didn't seem right. All things considered, The Duel was a bad movie experience for the British audience. Yes i knew it was used for a tv show, but i thought it was for the A-team. It was the part for shure that the truck went over the ridge into the valley. I reconise that part because of when the truck went over the ridge, the drivers door was open, also as in that tb show. Further i can't remember me anything out of the tv show. Excellent janihudi.... thanks for the film-link, will watch this film really soon! Got to see it yesterday - FINALLY! Great movie from a time when they made great movies. Recommended to others as well, if you are a fan of older, great movies. PS: Ordered myself a die-cast toy-car today, from Welly ( http://www.wellydiecast.com/index.php ): the Jaguar XJ (since they don't make the XJL version)... just like mine, scale 1:24. From China by e-bay, due to arrive some time after December 18th. Last edited by pakarang; December 2nd, 2018, 19:11. Reason: Added a PS-note. had you tryed other manufactorys? 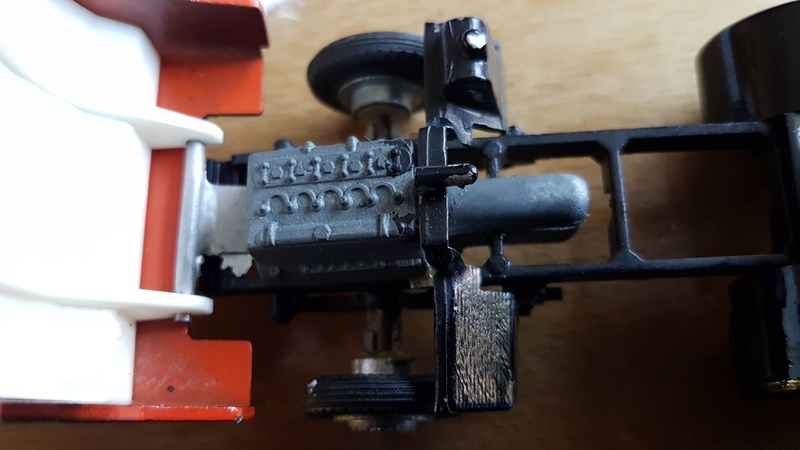 For model makers, https://youtu.be/HO_0f8tcBuI (25 minutes). Probably belongs in the Aviation forum but this is an active thread where the link is more likely to be seen. There are many more YouTube videos about model making but I particularly like this one, mainly because of the lights and motors. for a non aviation type of guy, i like it how its done with al the lights and rotating props. he made a beautiful model and coloring al the pits and pieces. even al those parts which you'le never wil see anymore. Hi Tommi. Yes he admits at 14:20 that the wiring is a mess and that he needs to improve his skills in future models. Maybe he could do something more like a car's wiring loom? it's a model for myself and a simple one. 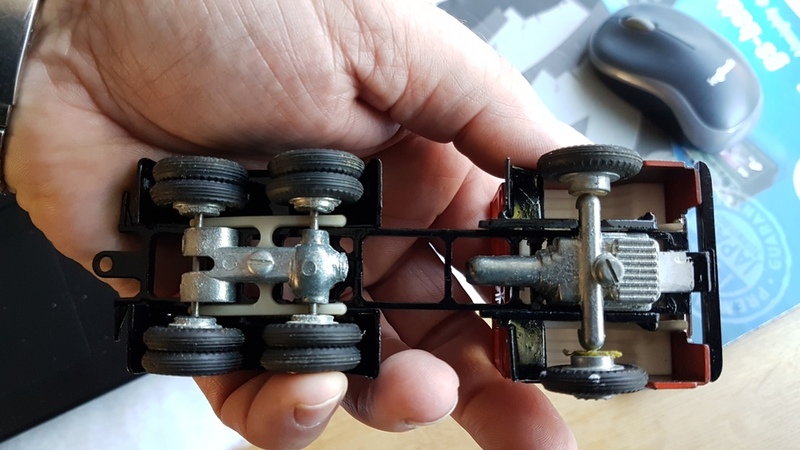 i bought 2 trucks with the same tanktrailer ,the best lloking trailer i keep it like it is,the other one i use for the model i want. 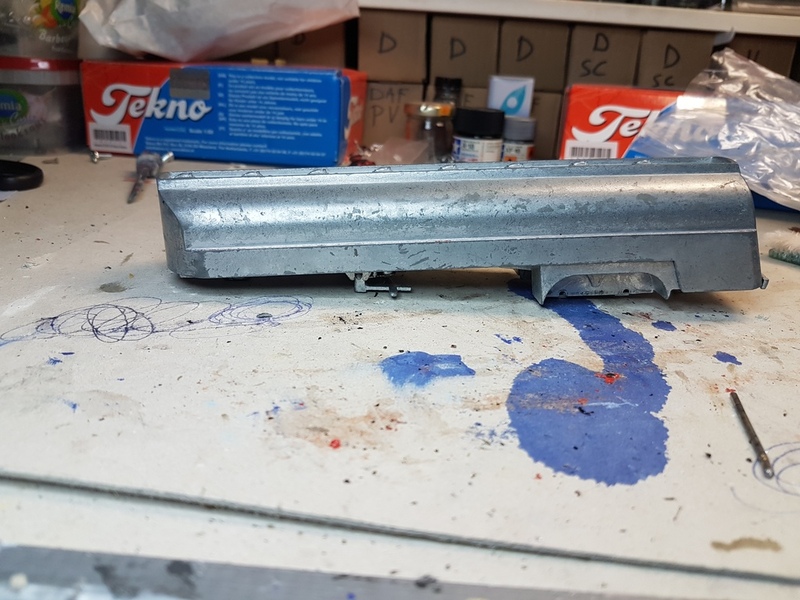 i will be a fantasiemodel, never build by the factory, and i wanted to use that black chassis in the background for the tandemaxles, but they have airsupension, which wassn't there yet that time. removed the rims, there will be nicer ones replaced (better looking). 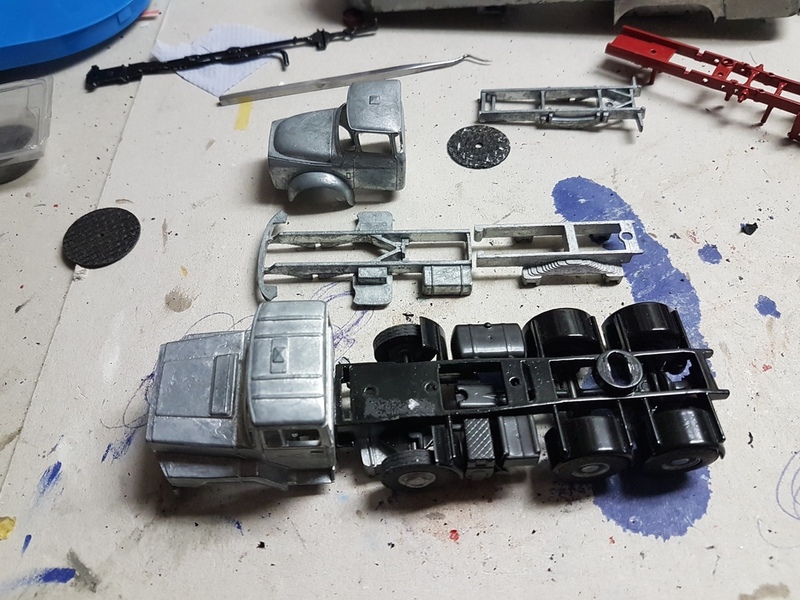 also the landinglegs will be replaced, don't know what to do with the kingpin. 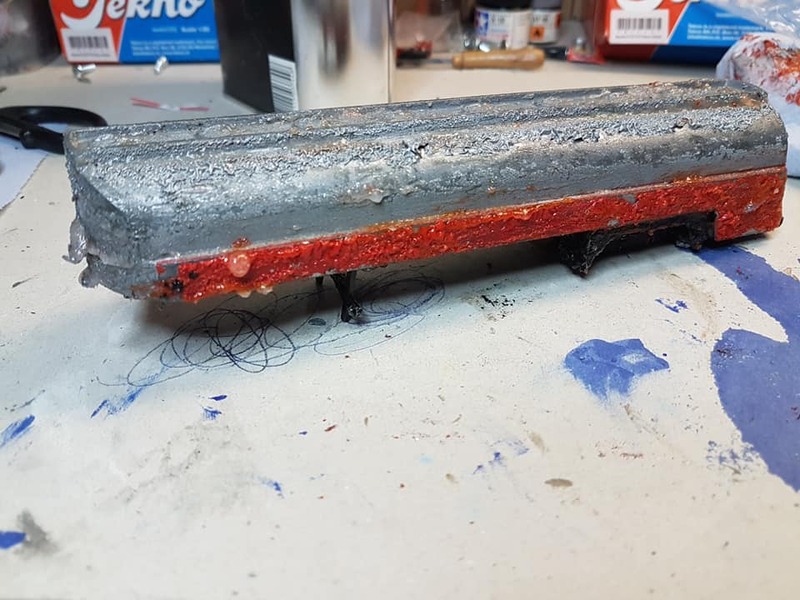 in the paintremover, just like the paint, there used to better stuff in the past ,damn envirements rules. What black chassis in the background????? I can see a black something in the second photo, it looks as if it is standing on end. Yahoo! I'm standing by to watch progress on the fantasy model. A janihudi special. Ah, thanks. I saw that bit but disregarded it as a useless left-over fragment of something else! "Useless?" mutters Thijs to himself - nothing here in my attic is useless! nothing will be trown away here. remember some years back that parts where missed? My Jaguar XJ from China arrived today - a die cast model from WELLY.... will share some photos or some video soon (I just need some time off any of my jobs first). what, not even 1 snapshot!!!!!!!!!!!!!!!! My Christmas gift for you. the newer old daf torpedo stays a three axle truck but with newer type chassis, with air suspension. 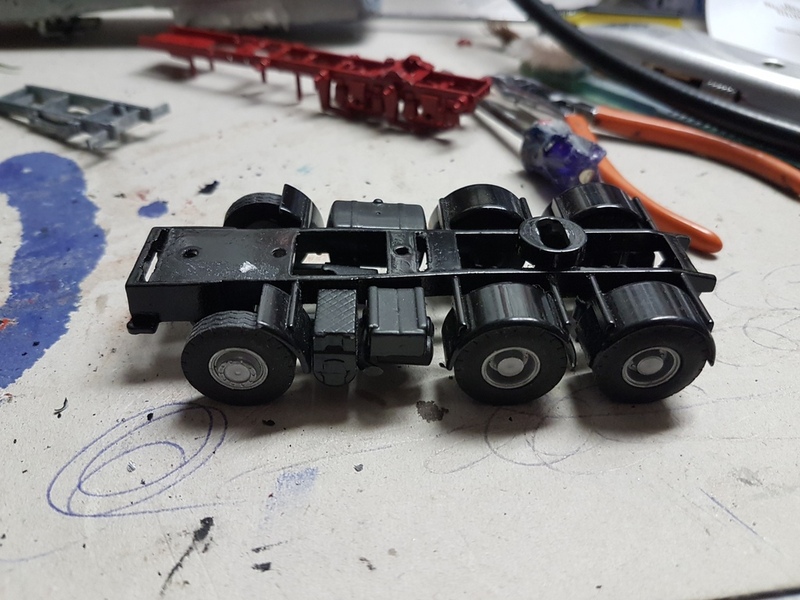 that black chassis will cut in two also and glued to the cab section. it will be cut just before the tandemaxle. 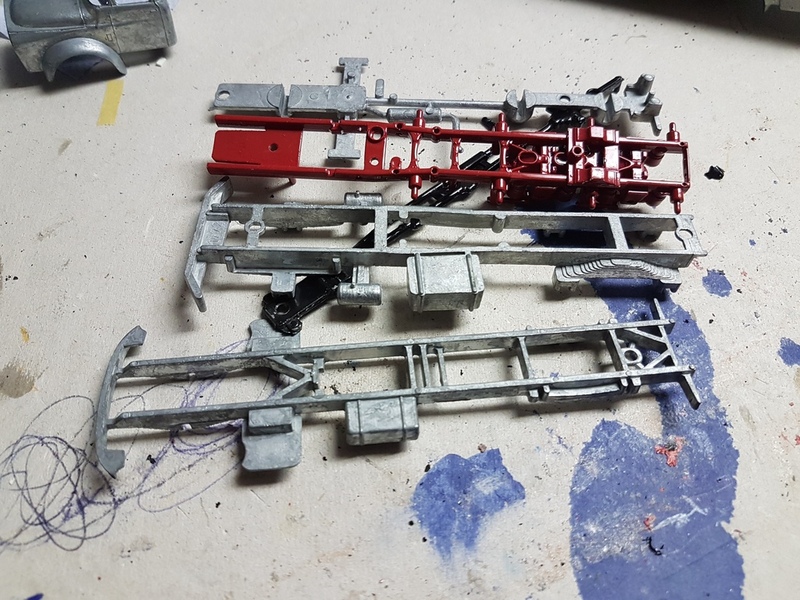 at least that was the plan ,but i got also that red chassis, it's just a chassis (you can see it in 644-2) and the tandemaxleset with airsuspension.